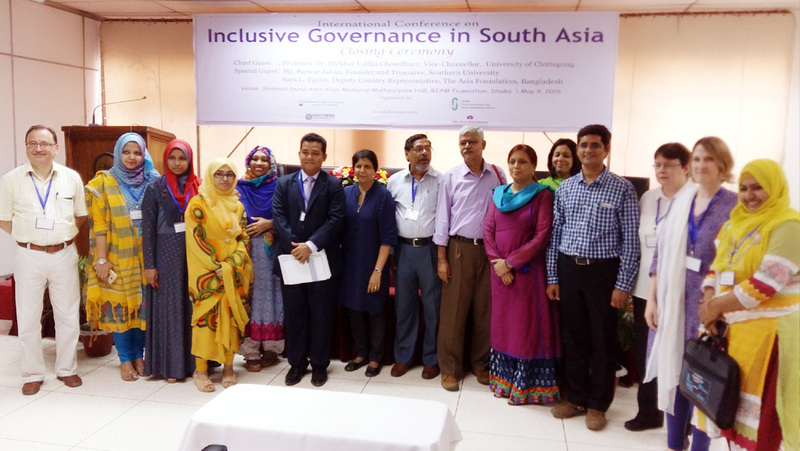 I recently had the privilege of participating in a conference on ‘Inclusive Governance in South Asia’ in Bangladesh on 8-9 May in the capital Dhaka. The conference was organised by Professor Nizam U. Ahmed, Chief Co-ordinator of the Public Administration and Governance Research Network and Professor at the Department of Public Administration of the University of Chittagong, in collaboration with colleagues at the Universities of Chittagong (Dr Amir Mohammad Nasrullah) and Dhaka (Dr Sadik Hasan). The conference was sponsored by The Asia Foundation, Southern University (Bangladesh), as well as the Universities of Dhaka and Chittagong. My local hospitality was generously provided by the conference organisers, and my international travel was kindly funded by the Institute of Asia and Pacific Studies as well as the School of Politics and International Relations, University of Nottingham. Several delegates came from elsewhere in South Asia, including India, Nepal, and Sri Lanka, as well as other parts of Bangladesh. Participants included Dr Subhash Kashyap, former Secretary-General of the Lok Sabha (lower house) of the parliament of India, scholars from Universities of Delhi and Mangalore; parliamentary secretariat officers and scholars from Nepal; and scholars from Sri Lanka including Professor IMK Liyanage from the University of Peradeniya, among others. Scholars from further abroad came from Turkey, US, UK, and Canada. Several international agency representatives attended and participated in the conference, including from The Asia Foundation, the British Council, and UNDP. In addition to the convenors, several scholars from Bangladesh led and participated in the sessions, including members of the Bangladesh civil service and journalists. Two panels were chaired by Bangladesh Members of Parliament. The conference keynote was given by Professor Ahmed Shafiqul Huque (McMaster University, Canada) on the topic of governance. He offered a critical assessment of the concept of governance, discussed its slipperiness, as well as issues related to the conference theme of inclusive governance. I was pleased to see that panels on the topic of women in parliament, women in local government, and women in the civil service in South Asia formed a prominent theme of the conference. I had been invited to present a paper on my research on women MPs in the Indian parliament. Our panel was the first of the conference after the more formal opening ceremony and we had papers on the same theme but covering different parliaments – Bangladesh, India, Sri Lanka and Nepal. The panel was chaired by a female MP from Bangladesh who provided some interesting insights into her own political experience. Nusrat Chowdhury, a scholar from Bangladesh kicked off the panel with her impressive presentation on women MPs in the Bangladesh parliament. As I was listening, it became clearer how, despite different contexts, women in electoral politics in the two South Asian nations face similar challenges within parliamentary institutions. The parallels with India were clear, even if women’s routes to elected office in Bangladesh were slightly different because of gender quotas in the national parliament. India has not yet managed to pass proposed legislation on a similar national quota or ‘reservation’, despite repeated high profile and sometimes controversial debates for many years, and especially since the mid-1990s. It was then my turn to present my paper and I focused on gender norms in parliamentary debates and committees in India. My findings drew on several years of research on the Indian parliament, formerly as part of the Leverhulme Trust-funded Gendered Ceremony and Rituals in Parliament project led by Professor Shirin Rai at the University of Warwick, but most recently work funded by a British Academy Small Grant on women parliamentarians in India. Professor Kamala Liyanage (University of Peradeniya, Sri Lanka) presented interesting insights into women’s participation in electoral politics in Sri Lanka. Given the very low numbers of women in the Sri Lankan parliament, she noted how hard it was to provide comparisons, and instead found it more instructive to discuss the barriers women face in electoral politics in Sri Lanka. Finally, the last presenter offered insights into women in electoral politics in Nepal. We carried on the conversations after the panel, and heard other scholars presenting their work in the related panels on women in governing institutions. Other panels at the conference gave a good flavour of research on other aspects of governance in South Asia. Conference organiser Prof Nizam Ahmed (Chittagong) and Prof Zahir Ahmed (Jahangirnagr) along with Ruth Fox (Hansard Society, UK) presented some preliminary research findings from their multi-country project on MPs and public engagement. I particularly enjoyed hearing about the fruits of the ethnographic approach to analysing the work of MPs’ as many of the themes resonated with our own methodology on the performance of representation. Another lively panel on Election Management in South Asia discussed questions that any scholar of democratisation processes would be keenly interested in. Throughout the conference the hospitality was superb – we were all very much taken care of, including one overseas participant who was really looking forward to reputed Bengali fish! A few of us visiting from overseas were treated to a tour of the national parliament, a meeting with the Deputy Speaker, and an awe-inspiring step inside the parliament chamber. I was interested to note the large screens inside the chamber, which were also a recent addition to the chambers of the national parliament of India, and allowed MPs to see the broadcast of proceedings – themselves and others – whilst sat in the chamber. The architecture of the building was striking, and the green landscapes and lake bordering the building were vast, lush and grand. They stood in contrast to the busy streets bustling with vegetable sellers, couriers and rickshaw pullers, juxtaposed with tall ultra-modern office buildings and shopping malls. I was keen to see something of the country’s garment manufacturing industry and hear local perspectives, but as time was short, my exposure was limited to the retail side for the domestic market only, and I spoke to several local conference participants about the state of the industry and any developments in workers’ rights since the Rana Plaza collapse in 2013. Apart from the outstanding hospitality, the conference was commendable for the encouragement it gave to younger scholars, postgraduate and early career, from Bangladesh and abroad, some of whom were presenting research at an international conference for the first time. This was a good sign that both scholars and scholarship on the topic of inclusive governance in South Asia is being nurtured. When international participants were invited to make comments during the closing ceremony, I strongly encouraged the conference organisers to continue this worthwhile regional collaboration. For me, comparisons always prompt questions that non-comparative analyses might take for granted or that may not occur to the researcher to ask, deepening our understanding of individual institutions and the importance of context as well as commonalities among institutions. For a first trip to Bangladesh, it was a memorable one. I left Dhaka looking forward to returning again, and excited about continuing conversations from afar with new friends and colleagues. Dr Carole Spary is an Assistant Professor in the School of Politics and International Relations and Deputy Director of the Institute of Asia and Pacific Studies at the University of Nottingham. Image credit: Author’s own. Wonderful writing dear Dr Carole. We will invite you in our next conference again. Dear Dr.Carole,good to read a well summarized piece on the conference.